Internationally acclaimed fine jewellery designer calls upon skills of Cumbrian blacksmith for his first ground-breaking foray in to the architecture and public arts realm. 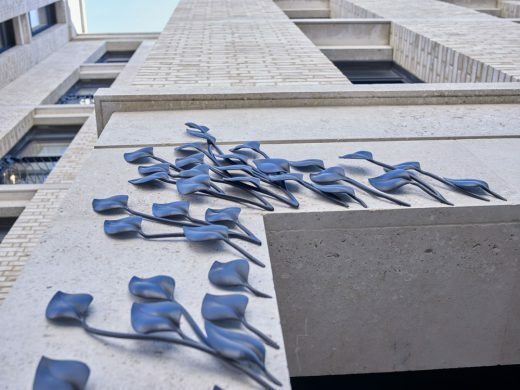 Internationally acclaimed jewellery designer, Shaun Leane has launched his first foray in to the architecture and public arts realm with the unveiling of, Arbour – a major bronze artwork across a 40m building façade in Kensington. Leane, noted for his one-of-a-kind catwalk jewellery and longstanding relationship with Alexander McQueen, was commissioned to design the building’s exterior metalwork by FutureCity and Grainger plc and it has become the largest scale commis¬sion in the UK to be undertaken by a jewellery designer. The launch of 21 Young Street is the culmination of a five-year long project and pushes the boundaries of conventional design. Leane was commissioned to design the 58 balcony railings and two gates across the 40m x 30m façade of the residential development, designed by Assael Architecture. Leane chose to work with British award-winning architectural and sculptural metalworkers, Chris Brammall Ltd for the fabrication and installation stage of the project. 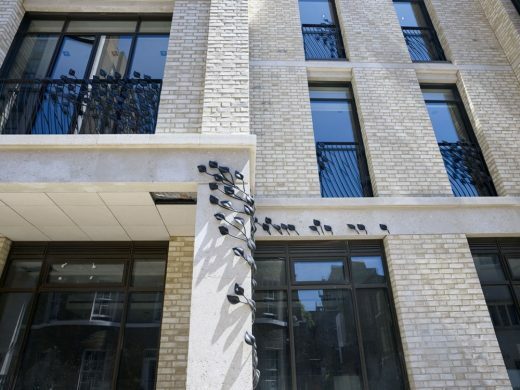 Arbour transports the greenery of neighbouring Kensington Square onto 21 Young Street and is made up of 1,850 bronze sculpted leaves and three-dimensional branches. Leane looked to mimic the leafy surroundings where trees soften and dapple the light in contrast to the area’s linear backdrops. Weaving their way across the façade of the building, the density of the leaves varies on each balcony as if blowing in an autumnal breeze. Leane wanted to capture both the fragility and strength of nature in the metalwork, a theme which heavily reflects Leane’s signa¬ture jewellery aesthetic. 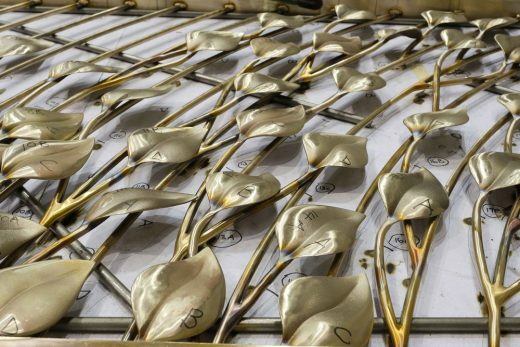 Each balcony, railing and gate has been handmade and the leaves finished by the hands of arti¬sans in Brammall’s Cumbrian workshop. The artwork is cast in Phosphor Bronze. Each of the balcony railings is unique, featuring hand-formed curves with the leaves cast and grated into steams, then patented and treated to give a rich bronze finish. Almost 3,000 linear metres of bronze sections are used to form the handrails. 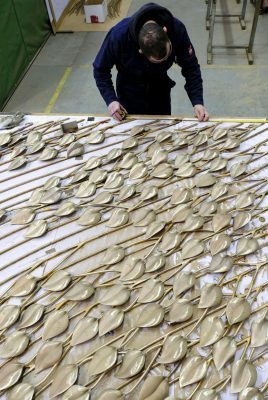 The leaves were cast at Brass Founders in Sheffield and all hand-finished at Chris’s workshop in Cumbria with the project taking over twelve months to complete. “The 21 Young Street commission has filled me with energy, it has been both exciting and chal¬lenging to be presented with the possibility of decorating a building’s façade and working to a scale larger than I ever have before. I believe that with creative freedom, innovation can truly flourish. To be invited to create a piece of art such as this and for it to be protected for 125 years is truly an honour and testament to our future legacy”. Shaun Leane’s design was selected following a competitive process facilitated by culture & placemaking agency Futurecity who were appointed by Grainger to curate and deliver the commission. A shortlist of three artists – including two jewellers and a designer – were invited to respond to a brief and present concept designs to an Arts Advisory Panel comprising representatives from Grainger, Assael Architecture, Royal Borough of Kensington & Chelsea, Futurecity, Victoria & Albert Museum and local residents.